The Stradus® Laser, with the wavelength flexibility of UV through the visible to the near IR, is the flexible platform to easily integrate multiple illumination wavelengths with the knowledge of a stable, reliable and low optical noise source for reliable fluorescence signal detection. The Stradus® line of lasers is a fully CDRH-compliant series of high-performance, circularized laser diode modules. The highly integrated Stradus® modules contain all the necessary optical power regulation, temperature regulation, communication interface, and protection circuitry. All Stradus® lasers are single mode TEM00 lasers. 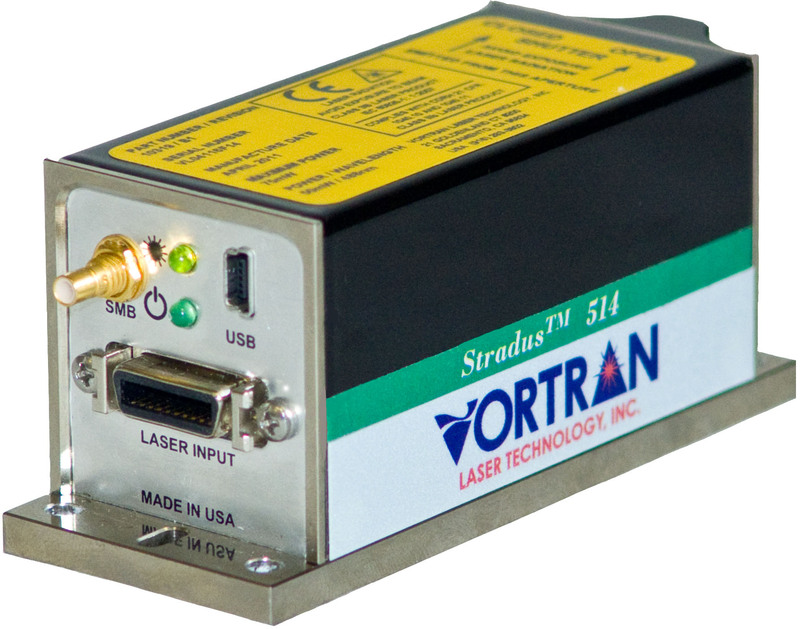 The Stradus® lasers feature both USB and RS-232 connectivity for easy to use control and monitoring of the system. A PC user interface software is provided to allow for easy setup of the system. 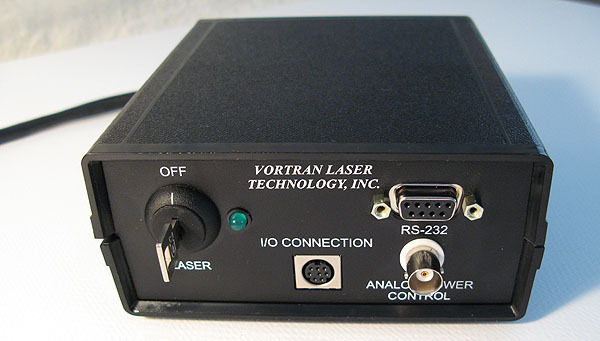 MD INNOVATION TECH personnel and engineering staff can assist you in selecting the proper laser for your application. OEM specials that are not currently listed can be obtained through joint efforts between your engineering needs and MD INNOVATION TECH personnel. Specifications for each Stradus® model will vary and are available in the specific model datasheet. An optional control box is available to provide DC power and support CDRH safety requirements. Also, the remote box provides the user with a convenient way of interfacing to the various control and status signals available to/from the laser head as well as providing for the required CDRH ON/OFF key switch. The Stradus® laser exhibits unparalleled power stability of better than 0.5% over a 24 hour period. Much of this improved stability can be attributed to the patented design of the optics module inside the Stradus® laser. All optics, including the power feedback loop, are sealed in a controlled micro-environment. The 405nm and 488nm lasers have over 40,000 hours of operational data collected with very little change in diode current. These results are unheard of in the diode laser module industry – but through the use of the innovative Vortran design and manufacturing processes, these results are routine. Another key feature of the Stradus® laser is that the circuitry has been designed to be immune from damage due to exposure to static electricity (laser diodes are highly susceptible to ESD damage). 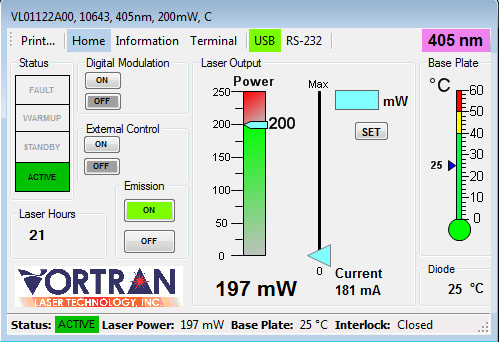 The Stradus® laser has been designed and tested to ESD levels exceeding 20 kV. The User Interface Software (supplied with each standard laser) is an interactive display allowing the user to monitor and control the laser through a computer interface. The user can turn the laser on/off, set power output levels, and enable/disable modulation features. A quick look at the display allows the user to see the three key parameters in graphical form (Output Power, Diode Current, and Diode and Base Plate Temperature). If and when a key parameter exceeds predetermined “safe” values, the graphical displays employs colors to help alert the user (yellow for caution and red for dangerous levels). Otherwise the graphical displays remain in the green region. A logging function displays the number of hours that the diode has actually been powered on.